Detailed weather forecast for Clarksburg from the NOAA website. 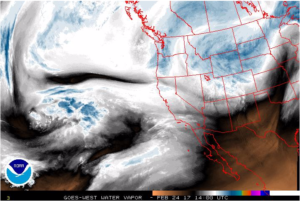 Click image for updated satellite animation. 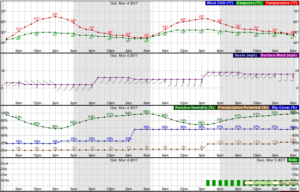 Click image for updated graphical weather forecast. Freeport USGS Data temperature, river level, flow, pH, turbidity, etc. Fremont Weir to Rio Vista river levels and flow. 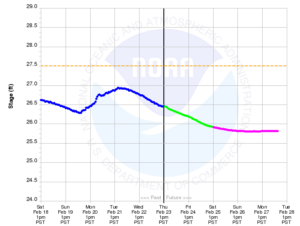 Click image for river level status at I Street Bridge. Click image for current reservoir levels. 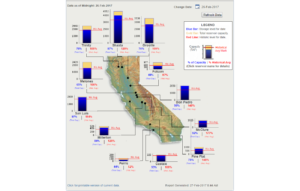 California Data Exchange Center (CDEC) A DWR webpage containing extensive information regarding the river system, water conditions, flood conditions, water storage, etc. Central Valley Flood Protection Board (CVFPB) Formerly known as the State Reclamation Board, this agency is responsible for ensuring that appropriate standards are met for the construction, maintenance, and protection of the flood control system. Levee encroachment permitting. Click this link to research and start the permitting process for the installation or repair of a fence, gate, dock, pipe, or any other structural change to a levee (including landscaping). State Water Resources Control Board (SWRCB) Visit this page for information on Water Rights, Water use Reporing, Irrigated Lands Regulatory Program, etc.